In 12-inch nonstick skillet, mix rice, seasoning package from rice mix and water. Heat to boiling over medium heat. Cover; cook 7 minutes. Add broccoli; cook 3 minutes longer. Spoon rice and broccoli onto 4 dinner plates. Cover to keep warm. Wipe out skillet. In same skillet, heat oil over medium-high heat. Sprinkle salt and pepper over pork; place in skillet. Cook 4 to 6 minutes or until bottoms are browned. Turn pork; cook 4 to 5 minutes longer or until pork is no longer pink and meat thermometer inserted in center reads 160°F. 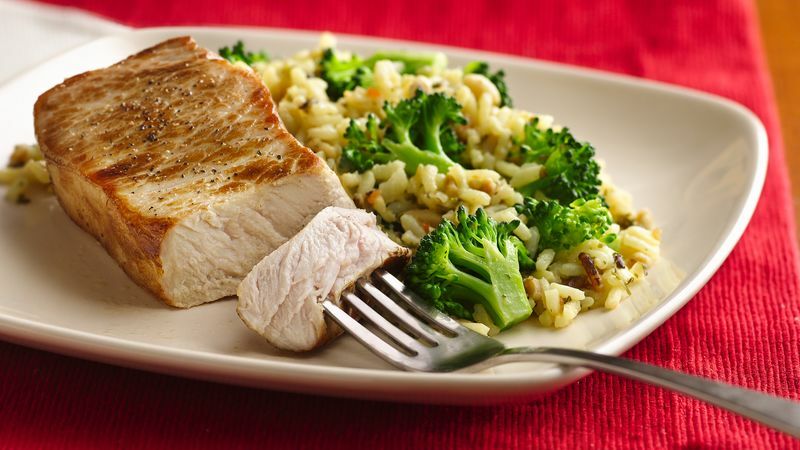 Serve pork with rice and broccoli. If your pork chops are thinner or thicker than 3/4 inch, adjust the cook time accordingly, and be sure to cook to 160°F. Any flavor of packaged rice mix can be used.